Copper remnant from casket company donated by a friend. Thick copper was well suited for raising the hull of the vessel. This image is after cutting the original sheet and making several passes of raising over my t-stake as well as some sinking into a wood stump and shot bag. Windows 10 apparently had to update between moving images from phone, camera and computer and resulted in mysterious disappearances of many good process photos. I think its time to ditch the windows control... So there are no good images showing the elements between rough hull shaping and fitting the deck and mast stay. Cast brass snake head for the ship along with cast brass 45 record adapter belt buckle project. The cast piece needed extra finishing time because I was a little rusty and rushed on the mold-prep side of things. 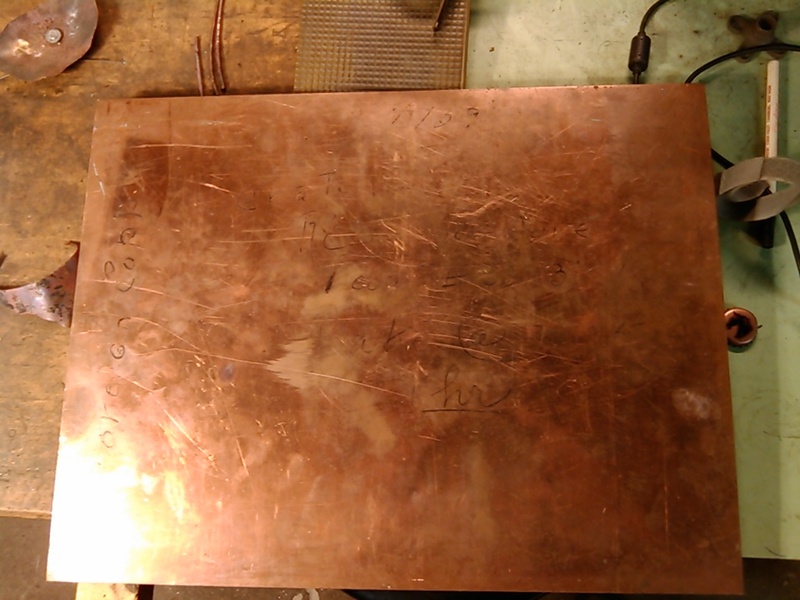 (lots of lost detail that had to be reworked into the metal by use of files and carbide bits. Head and tail installed, deck is being fitted and seated figure wire man is on board to inspect gunwale height. Mastfish fabricated and soldered onto deck. Repurposed lamp part made into mast that threads into fitting below deck for assembly and disassembly. 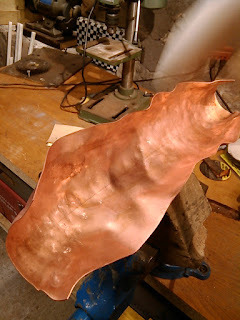 Architectural roofing copper was repurposed and made into shields for the ship. Copper wire from a track-light fixture was cut and forged into oars for the ship. More architectural copper was used to make the sail. Brass jump rings were used to hang the sail from the re-purposed copper grounding wire cross bar. Ship was finished off with a cast brass and copper pipe base, a ferric nitrate brown patina and an etched world snake symbol (Jörmungandr). an all nighter ending at about 8:30 am Oct. 5th before having to go to my big kid job at 10 on the and then leave work at 2 to deliver the new vessel and other vessels about 2 hours away only to turn around and work the next full day (6th) and then opening exhibit at the venue on the 7th. Exciting times! So I was too tired to realize how dark the images were in the white background images. Heat shrink tubing was used to allow oars to be snug yet functional. Steering oar made mostly from same light fixture threaded tube as the mast only forged into shape and attached to ship with brass pull chain from shop light to allow movement. newest vessels to be posted soon so check back for some new vessels made with new methods. Wow! this is unbelivable - i could hardely believe how the end product look like. I must appreciate your artistic skills. Keep up the good job of sharing this here.